We have a fantastic and full weekend of events to celebrate the closing of Prospect.4:TheLotus in Spite of the Swamp, including the much-anticipated presentation of Kara Walker’s new public artwork, The Katastwóf Karavan, which will be installed and activated daily on the bank of the Mississippi River in Algiers Point from Friday, February 23 through Sunday, February 25, and feature two special public performances with the artist and noted jazz pianist Jason Moran scheduled for Friday, February 23 at 4:30 p.m. and Saturday, February 24 at 2:30 p.m.
steam-power enthusiast Kenneth Griffard, constructed a thirty-two-note steam calliope similar to the one on the Steamboat Natchez and housed it in an arcane looking parade wagon of her own design. In critical response to the Natchez, Walker’s calliope plays songs and sounds she associates with the long history of African American protest music: gospel, reggae, jazz improvisation, chants, and shouts. During the closing weekend of Prospect.4 the organization will also name the Artistic Director for Prospect.5, the fifth iteration of the international contemporary art triennial scheduled for the fall of 2020. The Artistic Director of Prospect.5 will work closely with the Prospect New Orleans team. Roundtable discussion with Alexis De Vaux, Mia L. Bagneris, Brenda Marie Osbey, Lakeesha J. Harris and Niki Lopez. In collaboration with Xavier University’s Department of Fine Arts. Gallery Talk by Prospect.4 Artist Jon-Sesrie Goff with Anne Collins Smith, Curator of Collections at the Museum of Fine Art at Spelman College. Keynote speaker, artist Xenobia Bailey, with panelists Shantrelle P. Lewis, Dr. Kara Olidge, John Barnes, Dr. Tanisha Ford, and Carla Williams. In partnership with Dillard University Ray Charles Center for Material Culture. Prospect.4 Film Program: Horace Ové, Zac Ové, and Beatriz Santiago Muñoz. **Free and open to the public. Featuring the work of Prospect.4 Artist John T. Scott. The Weekly Monster began on November 8th, 2016. Taking the form of weekly black and white social media posts, special workshops, a gallery print edition, and posters displayed in public sites, the project collapses different aspects of the story of Frankenstein with contemporary world affairs. The original image-text pieces created by Lasch also serve as the starting point for others to produce their own monsters through public workshops, open calls, and direct invitation. Published on the occasion of Prospect.4: The Lotus in Spite of the Swamp, New Orleans, this special publication brings together all the weekly artworks and texts from the first year, as well as documentation of the installations and workshops produced in New Orleans. Additional texts include an introduction by Prospect.4 curator Trevor Schoonmaker, and a critical essay by Nicholas Mirzoeff. Download the free ebook version here, or purchase a hard copy here. Honoring Bard Early College, Urban Bush Women, Stone Pigman and P.4 Artistic Director Trevor Schoonmaker. Prospect.4: The Lotus in Spite of the Swamp, opened to the public on Saturday, November 18, 2017 to record crowds. More than 2,000 art professionals from around the world visited New Orleans for the opening of the exhibition, ushering in a wave of attention and new visitors at a rate that has outpaced past years. Throughout January and February, we will present workshops, artist talks, and educational programming, featuring art and artists from Prospect.4. 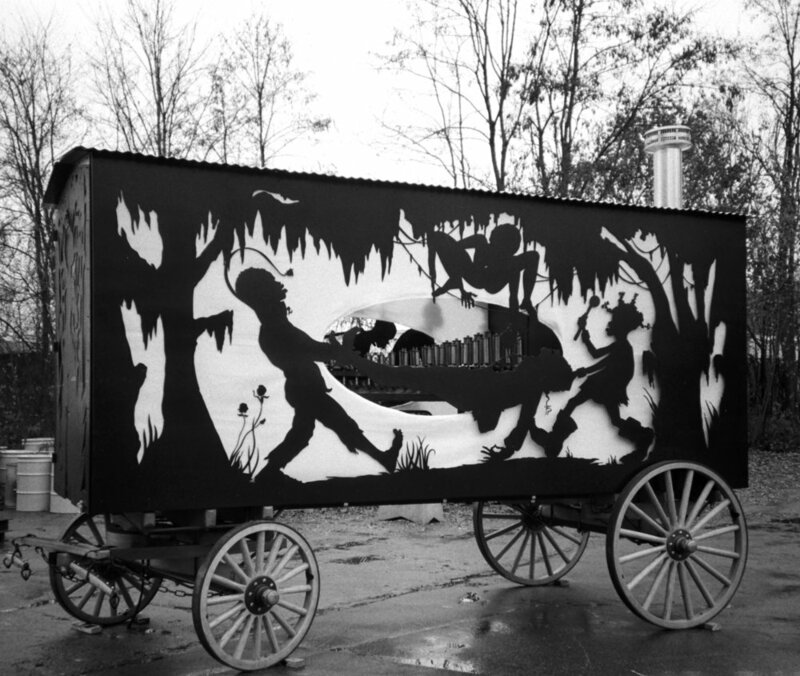 These events will culminate with the closing weekend of Prospect.4, including the much-anticipated presentation of Kara Walker’s new public artwork, The Katastwóf Karavan, which will be installed and activated daily on the bank of the Mississippi River in Algiers Point from Friday, February 23 through Sunday, February 25, and feature two special public performances with the artist and noted jazz pianist Jason Moran scheduled for Friday, February 23 at 4:30 p.m. and Saturday, February 24 at 2:30 p.m.
All galleries and Café NOMA remain open till 9 pm. For more information, email gulfsouth@tulane.edu or call (504) 314-2854. Youth oriented tour and mixed-media collage workshop with teaching artist Soraya Jean-Louis. P.4 artist Darryl Montana, Sabrina Mays Montana, writer Kalamu Ya Salaam, and photographers Chandra McCormick & Keith Calhoun.